This note describes a critical piece of evidence that can be used to indicate that bedrock frost heave has occurred beneath glacial ice. Bedrock frost heave occurring beneath glacial ice is not a common or expected occurrence. However, if it can be demonstrated that frost heave has occurred under glacial ice, then significant constraints are placed on the frost heave process. These constraints can then provide clues regarding the paleoclimate prevailing when the frost heave occurred. The above diagram shows an uncommon instance of bedrock frost heave where an elongated joint block is expelled entirely from bedrock substrate by frost-heave action. The process leaves behind a clearly defined empty hole along with the nearby displaced joint block. In cases where the joint block is expelled with no glacial ice present, the elongated block would be expected to topple over in a random direction. However, when several instances of the process diagrammed above occur in a local area, and the direction of toppling of the elongated blocks is consistently aligned, the probability that moving glacial ice influenced the process is greatly increased. Note: It is assumed that steeply-dipping jointing in the area under consideration is near vertical, or if not, that the dip of the joints (which could influence toppling direction) is taken into account. 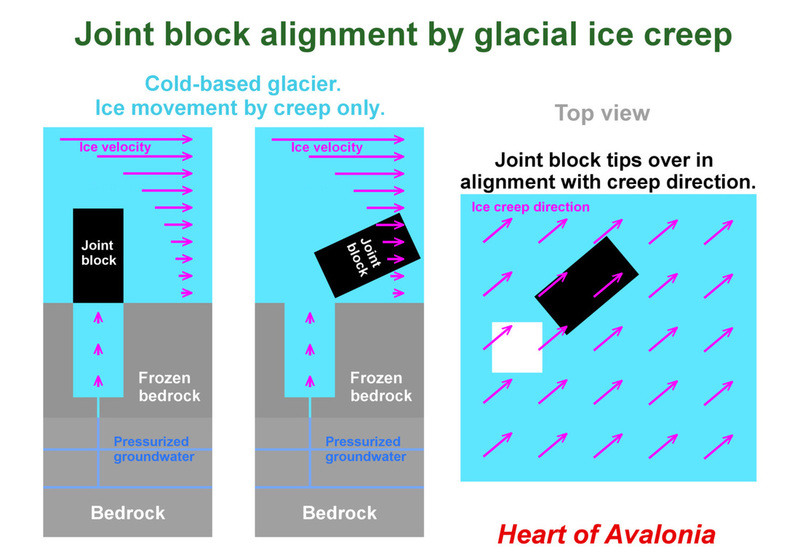 ​In a basal-slip glacial environment, a dislodged joint block would tend to be dragged down-ice from its point of origin with no preferred direction of alignment. In a creep-dominated glacial environment (above diagram), ice velocity is zero at ground level and increases with height. The top of an elongated joint block would experience a higher velocity of moving ice (hence greater ice load) than would the base. This differential ice loading would tend to tip the block over and to align the block with the direction of ice flow. 1) Ice flow direction in the area is known unambiguously from examining blocks of bedrock that have been detached and shifted short distances. A "reconstruction" is necessary to prove this condition. That is, a displaced rock section must clearly mate with the still-intact section of bedrock from which it was dislodged. 2) An elongated frost-heaved joint block is visible, dislodged from substrate, in an uncluttered neighborhood on a reasonably flat and level bedrock surface. 3) The hole where the joint block originated is well defined and the hole fits the size and shape of the nearby displaced block. 4) The displaced block lies a short (0-1 m) distance down-ice from the hole. 5) The elongated block is aligned in the known direction of ice flow. 6) There are multiple observations of frost-heaved bedrock meeting criteria 1-5, found in a local area. All of the above conditions are satisfied in one particular local region of extremely intense relict bedrock frost-heave activity on the Isthmus of Avalon. The implication becomes that in this area and other nearby areas, all bedrock frost heave occurred under ice and that hydraulic bedrock frost heave (see Note 5) was the dominant mechanism of bedrock disruption.